Lazada Philippines is set to launch its biggest series of Flash Sales this August 15, dubbed as “Wild Wednesday.” With big discounts of up to 88%, these deals will be spread out among three Flash Sales which will happen in the morning, at noon, and at night. Don't miss the chance to buy some of Lazada’s novelty items such as umbrellas and necklaces for as low as Php 39. Top tech items such as power banks, wireless mouse and electric drills are also up for grabs, for up to 50% off. Some of Lazada’s bestselling beauty products will catch your attention too. Among these include Precious Pad Nature’s Lemon Spa and Noni Soap for just Php 25, Aztec Clay for Php 39, and Ever Bilena’s City Romance Liquid Lipstick Beauty set at over 60% off. “Lazada has been working closely with its brands, sellers, and customers to provide the best online shopping and selling experience. For our sellers, Wild Wednesday is a great opportunity for better visibility and store ratings. With over 300,000 visitors each flash sale, the platform really is a wild win for everyone.” said Lazada CEO, Rey Alimurung. It doesn’t stop at discounts. 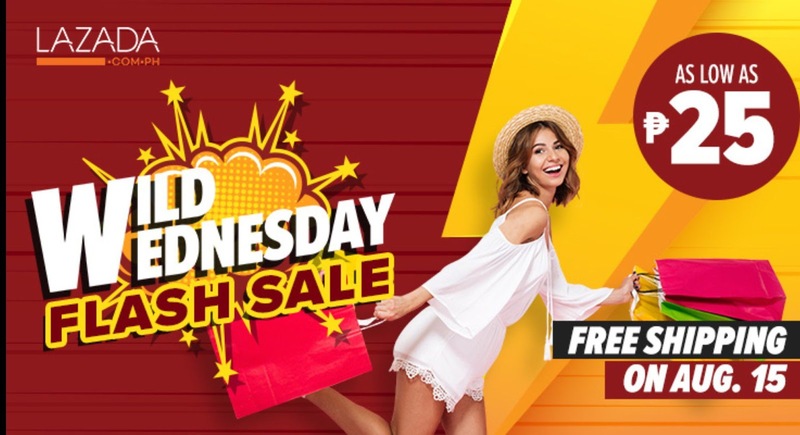 Lazada will also offer nationwide free delivery for any flash sale purchase this coming Wild Wednesday. Mark your calendars and gear up for the wildest Wednesday online shopping has ever seen. Visit www.lazada.com.ph or download the Lazada mobile app for free today to join the hump day fun!